We’d love your help. Let us know what’s wrong with this preview of These Hands by Margaret H. Mason. To ask other readers questions about These Hands, please sign up. I stumbled across this fabulous picture book the other day at school and promptly read it to my class. It precipitated a fantastic class discussion concerning discrimination and civil rights; a discussion that really engrossed the children’s attention and gave them something to think about. The story follows young Joseph, as his grandfather teaches him how to do many different things with his hands – from shuffling cards to playing a piano, to swinging a baseball bat or tying a triple bowline knot with his shoelaces. The message from grandfather to grandson is simple – anything you set your mind to achieve, you can, with persistence and hard work. Joseph’s grandfather goes on to share memories of a time when he and countless other African American people were constricted in how they lived their lives. He tells Joseph about the work restrictions he faced as a young man. He talks about how he once worked in a Wonder Bread factory, and how he wasn’t allowed to bake the bread with his own two hands because the white people didn’t want African American’s touching their bread. Joseph’s grandfather goes on to discuss how, using their hands, African American people wrote petitions, carried signs, joined hands and raised their voices together to initiate social change. This was such a poignant, yet subtle story. The themes relating to discrimination and the civil rights movement were introduced in a remarkable way to incite young readers. The illustrations by Floyd Cooper were also exceptional and thought provoking. This is a story about Joseph's grandpa. Joseph's grandpa was able to do so many amazing things with his hands like play piano or throw a curve ball. But there were some things that Joseph's grandpa was not able to do with his hands because of racial discrimination. The text in this book is simple but the content is deep. I really enjoyed the book. The illustrations were created from an oil wash with kneaded erasers. A grandfather lovingly shares moments from his life with his grandson. Memories of playing the piano, doing card tricks, and throwing baseballs at top speed are interspersed with pre-Civil Rights Act workplace discrimination. The historical element of These Hands is based on policies from the Detroit Wonderbread factory during the 1950s and ‘60s, which prohibited African-American workers from handling bread or using machinery involved in food preparation. To combat the unfair practices, the gran A grandfather lovingly shares moments from his life with his grandson. Memories of playing the piano, doing card tricks, and throwing baseballs at top speed are interspersed with pre-Civil Rights Act workplace discrimination. The historical element of These Hands is based on policies from the Detroit Wonderbread factory during the 1950s and ‘60s, which prohibited African-American workers from handling bread or using machinery involved in food preparation. To combat the unfair practices, the grandfather in the story, joined the Civil Rights Movement; writing petitions and holding protests and demonstrations. Don't miss this moving new picture book that combines a little-known piece of labor history and the civil rights movement with a tender portrait of a grandfather's close relationship with his grandson. Author Margaret Mason explains in an author's note that during the 1950s and early 1960s, African American workers at Wonder Bread and other bakery factories were allowed to sweep the floors, load the trucks, and fix the machines--but they were not allowed to work as bread dough mixers or bread do Don't miss this moving new picture book that combines a little-known piece of labor history and the civil rights movement with a tender portrait of a grandfather's close relationship with his grandson. Author Margaret Mason explains in an author's note that during the 1950s and early 1960s, African American workers at Wonder Bread and other bakery factories were allowed to sweep the floors, load the trucks, and fix the machines--but they were not allowed to work as bread dough mixers or bread dough handlers, "because the bosses said/white people would not want to eat bread/touched by these hands." Inspired by the stories she heard from an old friend who was a Bakers Union organizer, she wrote this inspiring tale of overcoming discrimination. Joseph's grandpa's hands can still teach a young fellow how to tie his shoes, play the piano, do card tricks, or hit a line drive. But because they weren't allowed to touch bread dough in the factory, "these hands joined with other hands," writing petitions and demonstrating until their proud hands could finally touch the bread dough. And Joseph, too, can do lots of things with his hands, now, all by himself, including baking "a fine loaf of bread." A refrain of "yes, you can" unites the free verse poetry of Mason's text. The incomparable illustrator Floyd Cooper, winner of four Coretta Scott King honor awards, provides the stunning illustrations, done in his signature oil wash style with kneaded erasers, which produces an almost glowing softness to the muted earth tones of the colors. Highly recommended for public and school libraries. 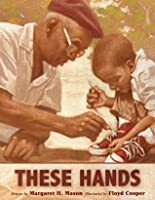 These Hands is a story about an African American grandfather telling his grandson about all the things his hands could do except for one thing, which was mixing and making bread dough in the Wonder Bread Factory during the 1950’s. In this powerful intergenerational story, Joseph learns from his grandfather that people joined their hands together to fight discrimination so that one day, Joseph’s hands and the hands of other just like him could do anything their heart desire. These Hands has severa These Hands is a story about an African American grandfather telling his grandson about all the things his hands could do except for one thing, which was mixing and making bread dough in the Wonder Bread Factory during the 1950’s. In this powerful intergenerational story, Joseph learns from his grandfather that people joined their hands together to fight discrimination so that one day, Joseph’s hands and the hands of other just like him could do anything their heart desire. These Hands has several themes from a little-known piece of labor history and the civil rights movement to a close relationship between a grandfather and his grandson. The illustrations are oil wash style with kneaded erasers, which produces an almost glowing softness to the soft earth tones of the colors which has gives the illustration that photograph appearance. The target audience for this book would be children between the age of 4 – 8 years old and the book can be used n in the classroom to discuss civil rights movement and some of the struggles African American faced during the 1950’s. These Hands by Margaret H. Mason, illustrated by Floyd Cooper gently introduces discrimination and the Civil Rights Movement as Joseph learns, from his grandfather, that people joined their hands together to fight discrimination so that one day, their hands, and Joseph’s hands, could do anything at all in this whole wide world. Joseph’s Grandpa could do almost anything with his hands: play the piano, throw a curveball, and tie a triple bowline knot fast. But in the 1950s and 60s, he could not ba These Hands by Margaret H. Mason, illustrated by Floyd Cooper gently introduces discrimination and the Civil Rights Movement as Joseph learns, from his grandfather, that people joined their hands together to fight discrimination so that one day, their hands, and Joseph’s hands, could do anything at all in this whole wide world. Joseph’s Grandpa could do almost anything with his hands: play the piano, throw a curveball, and tie a triple bowline knot fast. But in the 1950s and 60s, he could not bake bread at the Wonder Bread factory. Factory bosses said white people would not want to eat bread touched by the hands of the African Americans who worked there. Grandpa tells how workers joined hands, wrote petitions, carried signs and raised voices together to overcome discrimination. Based on stories of bakery workers, this book tells an important story in a gentle, non-preachy way. The font used is large. A detailed Author's Note concludes the book. Cooper's illustrations are oil wash with kneaded erasers. Their textured look is inviting and brings viewers into the story. Some of my favorite images include the front cover, playing the piano, Grandpa teaching a waterfall shuffle, practicing batting, Grandpa sweeping, petition writing, raising voices, Joseph tying his shoe, Joseph with baked bread, and the final image. This is a wonderful addition to books about discrimination and the Civil Rights movement for young readers. It's also a fine inter-generational story with the message of the many possibilities now availible to children today. Cooper's illustrations should land this on some Best of 2011 lists and award consideration. This is highly recommended for school and public library collections. In this story Joseph spends a lot of time with his Grandfather. Grandfather teaches Joseph different things like playing the piano and making bread. But, even with all the things that Grandfathers hands could do, he tells Joseph that there was a time during the Civil Rights movement that his hands could not make bread in a factory because he was black. Grandfather goes on to share how the same hands that played the piano and played baseball petitioned and fought for the rights of African Americans all around the country. It was because of his fight and that of many others that made it possible for African Americans to work on factories like Wonder Bread. The story ends with Joseph showing off his fine loaf of bread and Grandfather telling Joseph that his hands could do anything! The Civil Rights Movement is such a huge topic for children to learn about and consider. I think that this book opens the door for teachers of students in elementary school to address the topic of civil rights. I love the angle that Mason decides to tell the story from, with a focus on hands. It puts it into perspective that even though there were so many things that people could do (with their hands), they were prohibited from doing them because of their color. With the same hands that people did other things, they also fought for the rights of this generation. This poignant story shows how the fights of our elders paved the way for all of the things that we can do with our hands today. It also shows that there is much to be learned from our elders. I think that teachers can use this book in their classroom to not only teach about civil rights but also about respecting our elders, following your dreams, how citizens influence change in communities, and growth mindset. These Hands by Margaret H. Mason & illustrated by Floyd Cooper. is about a young African American boy named Joseph who has a grandpa who can do just about anything with his own two hands. He can play the piano, throw curveballs, and even tie a triple bowline knot in three seconds. Although since it is the 1950s and 60s, Joseph’s grandfather wasn't allowed to bake bread in the Wonder Bread Factory since the boss said white people wouldn’t buy or eat bread cooked and touched by the hands of an These Hands by Margaret H. Mason & illustrated by Floyd Cooper. is about a young African American boy named Joseph who has a grandpa who can do just about anything with his own two hands. He can play the piano, throw curveballs, and even tie a triple bowline knot in three seconds. Although since it is the 1950s and 60s, Joseph’s grandfather wasn't allowed to bake bread in the Wonder Bread Factory since the boss said white people wouldn’t buy or eat bread cooked and touched by the hands of an African American. Joseph learns through this powerful story that many people are joining together to fight discrimination so that one day, Joseph hands, and many other hands can do anything at all in this world. These Hands is written from the perspective of a Grandfather talking to his Grandson. The Grandfather lists several things that his hands had done over the years, such as play piano, shuffle cards, and take an active part in the Civil Rights movement. The point that the Grandfather is trying to teach his Grandson is that if his hands did so much, then there is no limit to what his Grandson's hands can do. I love the constant metaphor throughout the book of, these hands changed history. It is a gr These Hands is written from the perspective of a Grandfather talking to his Grandson. The Grandfather lists several things that his hands had done over the years, such as play piano, shuffle cards, and take an active part in the Civil Rights movement. The point that the Grandfather is trying to teach his Grandson is that if his hands did so much, then there is no limit to what his Grandson's hands can do. Joseph's grandpa could do almost anything with his hands, like playing the piano, throwing a curve ball, and tie a bow in "three seconds flat." But once there were things those same hands could not do. In this quietly powerful picture book, the discrimination African Americans felt before the passing of the Civil Rights Act when trying to work is respectfully portrayed through the oral history of one grandfather to his grandson. Based on a true experience, this is a subtle way to introduce the f Joseph's grandpa could do almost anything with his hands, like playing the piano, throwing a curve ball, and tie a bow in "three seconds flat." But once there were things those same hands could not do. I really love the gentleness in this book--such a terrific introduction to Civil Rights and a large, hard section of our American history in a way that very young children can begin to appreciate. Cooper's illustrations are outstanding, as usual. I really liked this one! Surprised by its unexpected depth. Summary: This historical realistic fiction picture book tells a wonderful story about overcoming discrimination as Joseph learns about his grandfather’s past during the Civil Rights Movement. Joseph’s grandfather tells about all of the things he can do with his hands: play the piano, throw curve balls, and tie a triple bowline. However, in the past, he was not able to work in a factory to make bread because of racial discrimination. This book talks about how African Americans joined their hands Summary: This historical realistic fiction picture book tells a wonderful story about overcoming discrimination as Joseph learns about his grandfather’s past during the Civil Rights Movement. Joseph’s grandfather tells about all of the things he can do with his hands: play the piano, throw curve balls, and tie a triple bowline. However, in the past, he was not able to work in a factory to make bread because of racial discrimination. This book talks about how African Americans joined their hands to fight for their rights by writing petitions, carrying signs, and using their voices to be able to do anything their hands. This book is a great tie in with the body and also exposes students to the past diversity, discrimination, and prejudice. Students will be able to perspective-take and think about how they might feel if someone told them they couldn’t do what they wanted with their hands. Characteristics to Support Genre: This book blends historical facts with fiction and has characters that behave in realistic ways. It tells about Joseph’s grandfather’s past that takes place during the Civil Rights Movement. Joseph’s grandfather was involved in a problem that is real for that time period. The plot uses a mixture of real and fictional events. Language Arts/Art: Students could discuss what they know about discrimination and the Civil Rights. They might link their past experiences with those of Joseph’s grandfather – although they might be very different. We could talk about fairness and discriminiation/prejudice. This could also be a tie in to Grandparent’s Day where students could write about what they love to do with their grandparents. They could also talk about being thankful for what their family has done for them. Students could write or talk about things that their grandparents or immediate family has sacrificed for them, taught them, or helped them in their lives. A grandfather teaches his grandson, Joseph, what his hands were able to do when he was younger such as playing baseball and the piano. He teaches these things to his grandson. The grandpa then tells his grandson how African American's were not allowed to handle the dough at the bread factory he worked at. His hands were used to get everybody together to write petitions for change and justice to happen. The pictures are beautiful and almost look like actual pictures. My response: This was an excel A grandfather teaches his grandson, Joseph, what his hands were able to do when he was younger such as playing baseball and the piano. He teaches these things to his grandson. The grandpa then tells his grandson how African American's were not allowed to handle the dough at the bread factory he worked at. His hands were used to get everybody together to write petitions for change and justice to happen. The pictures are beautiful and almost look like actual pictures. My response: This was an excellent book I enjoyed reading. It reminds me of how my grandfather always told me stories about his past. The author does a good job slowly transitioning into the social injustices the African American's had to endure at the factory. The Author's Note in the back of the book goes into more detail about the issue at the factory. It still kind of amazes me that all this happened considering the 1960's was not that long ago. I can not imagine what it must have been like living in that era. I really thought the last page was inspiring because the grandfather is telling his grandson, "Look at those hands, those hands can do anything, anything at all in this whole wide world." Classroom Connection: This is good book to have students talk about favorite things they may do with their grandparents and also to talk about the Civil Right's movement. Student's can learn about Dr. Martin Luther King Jr. and learn about the role he played in order for change to occur. When I was in 3rd or 4th grade we listened to the I Have a Dream Speech and then we were supposed to journal about a dream we had. We also had to brainstorm about any local issues that our community had and we had to figure out possible solutions. Looking back, I think that is a great way to connect the past to the present. 1. Text to text connection: The part of this book that explains what people did to make their voices heard reminds me of the book We March by Shane W. Evans. Both of these books show, in simple words and pictures, what those who were fighting for civil rights did. It shows how they made signs, gave speeches and worked together to help to get their point across. Both of these books give a young audience the chance to see what it was like to be an African American during the civil rights movement. 1. Text to text connection: The part of this book that explains what people did to make their voices heard reminds me of the book We March by Shane W. Evans. Both of these books show, in simple words and pictures, what those who were fighting for civil rights did. It shows how they made signs, gave speeches and worked together to help to get their point across. Both of these books give a young audience the chance to see what it was like to be an African American during the civil rights movement. 2. Does the book expose children to multiple perspectives and values? -Remembering: What things did African Americans do to speak out for civil rights? -Understanding: Explain what the title of the book means. -Applying: What examples can you find that life for the Grandpa, when he was young, and the life of the grandson are different? -Analyzing: How would you compare the ways that people made their voices heard during the civil rights movement to how people would make their voices heard today? -Evaluating: How would you feel if your Grandpa was telling you this story? "These Hands" by Margaret Mason is a story about a African American grandfather and his grandson. The story begins by the grandfather telling his grandson what his hands used to be able to do, such as throw a curve ball and play the piano. The grandfather then begins to tell his grandson about what his hands couldn't do growing up because of the color of his skin, such as touch the bread in the bakery. Then, he explains to his grandson that his hands joined together with other hands for change. Now any hands, no matter the color of your skin, can do anything and because of the boys' grandfather, he gets to live a life of freedom and equality. The theme in the story is to stand of for what you believe in and you will succeed. The grandfather came together with many other African Americans and stood up against racism and changed the world. Because of him and many other African Americans, we have equality and freedom among our nation. I gave this book a five star rating. I can relate to the grandson in the story because I also look up to my grandparents and have learned so much from them, just by hearing about the experiences that they have encounter throughout their life time. I have learned so many life lessons from their wisdom, as well as being educated about this history they have lived through, including war, the civil rights movement, economic decline and more. Plot: Margaret H. Mason's powerful picture story-book tells the story of a Grandfather and Grandson spending time with each other playing the piano, playing ball and tying shoes. The book also tells the story of African-American workers not allowed to work with bread-dough at the Wonder Bread Company. Joseph’s grandfather’s hands can still do so many amazing things. He used to be able to tie knots very quickly, now he helps Joseph learn to tie his shoes. He can play the piano. He can show Joseph how to do a waterfall shuffle with cards. He could pitch a curve ball in his youth, now he can teach Joseph to hit a line drive. But there were things his hands couldn’t do when he was younger. His hands were forbidden to touch the bread dough in the Wonder Bread factory. His hands could touch the bro Joseph’s grandfather’s hands can still do so many amazing things. He used to be able to tie knots very quickly, now he helps Joseph learn to tie his shoes. He can play the piano. He can show Joseph how to do a waterfall shuffle with cards. He could pitch a curve ball in his youth, now he can teach Joseph to hit a line drive. But there were things his hands couldn’t do when he was younger. His hands were forbidden to touch the bread dough in the Wonder Bread factory. His hands could touch the broom to sweep the floor, work the line, load the trucks, but not touch the bread. So his hands helped with the protests and organizing, and now all colors of hands can touch the bread dough. His hands can do anything in the world. This is a powerful book that speaks of discrimination in a very tangible way that children will clearly understand. Mason writes from the point of view of that grandfather speaking to Joseph. The book has a clear point of view, a ringing tone, and a wonderfully light hand. Looking at a grandfather through his hands makes him so human yet so amazing. This focused approach makes the book even stronger. Cooper’s art is stellar. The illustrations have a softness that is beautiful, all hard edges softer and rounder. The light in the art is also particularly well done with its warmth that stays consistent even during the dark times of the story. The art shows such strength, such vivid storytelling. Highly recommended, this is a picture book about discrimination and civil rights that will work very well with small children. There’s plenty to discuss here in a classroom or in a living room. Appropriate for ages 4-7. Summary: The book These Hands by Margaret Mason is a wonderful story about a young boy named Joseph and his grandfather. Joseph's grandfather discusses all the the things he could do with his hands such as playing piano, or baseball. Later in the book, Joseph's grandfather explains that although he was able to do a lot, he was not allowed to touch the bread at the factory he worked at because of his race. Joseph's grandfather then explains how many African Americans came together to fight discri Summary: The book These Hands by Margaret Mason is a wonderful story about a young boy named Joseph and his grandfather. Joseph's grandfather discusses all the the things he could do with his hands such as playing piano, or baseball. Later in the book, Joseph's grandfather explains that although he was able to do a lot, he was not allowed to touch the bread at the factory he worked at because of his race. Joseph's grandfather then explains how many African Americans came together to fight discrimination through protests, and because of this Joseph is now able to do anything with his hands. Theme: The theme in this story is about determination. Children can learn about the importance of standing up for what is right while also learning about the history of the civil rights movement. Personal Response: I personally relate to this story because it reminds me of the instances where my grandparents would explain what the world was like when they were growing up. I have always found that as time goes on the world around us changes so much and stories from our elders are one of the most useful tools to teach us about what life was like. Joseph’s grandpa is his hero. There is nothing Grandpa can’t do! He can do anything with his hands he wants, except for using them to make bread at the Wonder bread factory. In this story, Joseph’s grandpa shares the story of how he was able to work at the factory as long as he never touched the product because of the color of his skin. Joseph learns that his grandpa, along with others, fought hard to make sure Joseph and his friends would be able to do anything they wanted with their hands incl Joseph’s grandpa is his hero. There is nothing Grandpa can’t do! He can do anything with his hands he wants, except for using them to make bread at the Wonder bread factory. In this story, Joseph’s grandpa shares the story of how he was able to work at the factory as long as he never touched the product because of the color of his skin. Joseph learns that his grandpa, along with others, fought hard to make sure Joseph and his friends would be able to do anything they wanted with their hands including making bread at the factory. That is something that Joseph will forever be grateful to his grandpa for. This book would appeal to elementary students of all grade levels. The story is simple enough that younger students can understand the ideas behind racial discrimination and the attitudes towards African Americans during Joseph’s grandpa’s generation. The story can also be used with older students to start a study on the Civil Rights Movement to explain the reasons behind the start of the movement. I thought this book was great. It would be a perfect book to use to teach children of any age a little bit about the Civil Rights Movement. The illustrations are great and the story is simply told. I liked this book because I could relate to feeling that your grandpa was the most amazing person in the world who could do anything. Joseph's grandfather tells his story of all the things his hands have done, from tying shoes and playing the piano, all the way up to changing the world. Joseph’s grandfather expresses the challenges he had to face based upon the color of his skin. This beautifully written book discusses the hardship Joseph’s grandfather had to deal with and his journey to overcome these ha Awards received? Joseph's grandfather tells his story of all the things his hands have done, from tying shoes and playing the piano, all the way up to changing the world. Joseph’s grandfather expresses the challenges he had to face based upon the color of his skin. This beautifully written book discusses the hardship Joseph’s grandfather had to deal with and his journey to overcome these hardship and make world changing steps. Margaret H. Mason perfects this book about civil rights in a simple fashion. Without going too far into detail, she educates her readers on the hardships African Americans had to overcome. A beautiful read from beginning to end; Such a strong message shines through each page. I would certainly add this book to a classroom library. This book is emotion provoking. I would love to hear how my students react when Joseph’s grandfather was told he could not handle the bread. A writing prompt would be appropriate in this situation. Student would be given plenty of time to write about their feelings. Other informative texts and images for this time period would be available to deepen the students understanding of the situation. A read aloud of the students responses would be offered, if the students would like to discuss what they felt. This is a short, picture book that tells the story of a young boy and his grandfather. As they spend the day together, the boy’s grandpa tells him some of the many things that he and other African Americans were not allowed to do before the civil rights movement. After detailing many of the roadblocks thrown in his path, the boy’s grandfather then tells him of the ways people joined together in order to squash those ideas and accomplish what they wanted to do. Told in a light hearted, somewhat p This is a short, picture book that tells the story of a young boy and his grandfather. As they spend the day together, the boy’s grandpa tells him some of the many things that he and other African Americans were not allowed to do before the civil rights movement. After detailing many of the roadblocks thrown in his path, the boy’s grandfather then tells him of the ways people joined together in order to squash those ideas and accomplish what they wanted to do. Told in a light hearted, somewhat poetic way, this book makes for an easy read and a great addition to my text set. I chose to include this book towards the beginning of my set as well, because it starts to show a turning point, in my opinion. 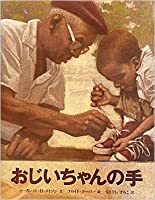 The grandfather makes sure he teaches the boy that together, people were able to overthrow the negativity directed towards African Americans and not just endure it. While none of these books showcased someone sitting back and accepting hate, These Hands shows an adult teaching the importance of standing up for yourself and the HUGE benefits that sometimes follow. In this wonderful, simple yet profound book an African American grandfather tells his grandson that despite all the wonderful things he could do with his hands he could not touch the bread dough in the Wonder Bread factory were he worked as a young man. The story is very moving and beautifully illustrated in soft oil wash shades. The story is based on true situations in American bakeries prior to the Civil Rights Act of 1964. There was legal discrimination in hiring even in the North and African Americans could not participate in many jobs even in integrated factories. At the same time the kind, gentle and multi-talented grandfather tells his grandson about the injustice he experienced, he encourages him and teaches him that his hands can do anything “in this whole world”. Injustice can and has been overcome in this story and the grandson has opportunities that the grandfather did not have. The story is told in a loving and supportive way that gets across the point with hope, pride and optimism. This is a book that children can relate to through the grandson – who learns to tie his shoe, play the piano, play with cards and look to the future. Because it is based on historic facts it can be used effectively in the classroom to teach about discrimination in a way that is very specific yet universal. Summary: This book is about a grandpa who is telling his grandson about how times were different for him growing up. He talks about how he could not always touch bread in the bread factories but only sweep the floors. However, grandpas voice along with others were heard in the book and they used their hands to sign a petition to make things different. Now his hands can do lots of things just like his grandson Joseph's hands. This book inspires others and shows that racial discrimination was over Summary: This book is about a grandpa who is telling his grandson about how times were different for him growing up. He talks about how he could not always touch bread in the bread factories but only sweep the floors. However, grandpas voice along with others were heard in the book and they used their hands to sign a petition to make things different. Now his hands can do lots of things just like his grandson Joseph's hands. This book inspires others and shows that racial discrimination was overcome. Teaching Idea: This book would be good to use for second grade when talking about the Civil Rights Movement in social studies. After you read the book you could talk about the Civil Rights Movement and how things were different then verses now. You could also incorporate an ELA activity by having students write and illustrate things they can do with their hands with the same sentence starter used in the book and then have students share what they wrote about to the class or in groups.